Just got a book in the post today. "Fighting Traffic - The Dawn of the Motor Age in the American City" by Peter D. Norton. "Until the 1920's, under prevailing conceptions of the street, cars were at best uninvited guests. To many they were unruly intruders. They obstructed and endangered street uses of long-standing legitimacy. As a Providence newspaper editor expressed the problem in 1921, 'it is impossible for all classes of modern traffic to occupy the same right of way at the same time in safety.'" "Today we tend to regard streets as motor thoroughfares, and we tend to project this construction back to pre-automotive streets. 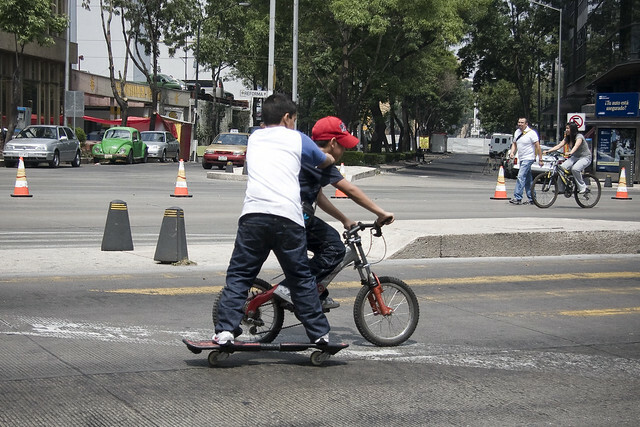 In retrospect, therefore, the use of streets for children's play (for example) can seem obviously wrong, and thus the departure of children from streets with the arrival of automobiles can seem an obvious and simple necessity. Only when we can see the prevailing social construction of the street from the perspective of its own time can we also see the car as the intruder. Until we do, not only will we fail to understand the violent revolution in street use circa 1915-1930, we will not even see it. This is why the full scale of the wave of blood, grief and anger in American city streets in the 1920's has eluded notice." "Prevailing social constructions of the street, for example, were stable in 1900. The automobile destablized them. Social groups, such as pedestrians, parents, police and downtown business associations, organised to preserve the streets as they knew them. But their actions threatened to limit the automobile's urban horizon. In the 1920's, automotive interests (or motordom, as they were sometimes called) proposed that customary social constructions of the street were outdated and that only a revolutionary change in perception of the street could ease congestion and prevent accidents." And I'm only on page 2. Wow. Motordom (great word) still reigns supreme. They succeeded in changing the perception of the street and these perceptions are deeply-rooted. Even in bicycle circles. Just listen to the buzz that comes out of the UK lately, about how 'we don't have room for infrastructure!' Besides being silly - look at all the narrow-streeted European cities that have managed it - it reveals that these cyclists are, perhaps without being aware of it, preaching the doctrine of motordom. Instead we should - and we are in many, many places - redefine our social construction of the streets. Placing the emphasis on people and human-powered transport instead of paying expensive tithes to the Church of Motordom, taking part in the rituals associated with it - when few of us, deep down, actually believe in it. If we say that streets have been around since cities first were formed, around 7000 years ago, then surely our social construction of what streets should be for should be anchored in the human perspective prevalent for the first 6900 of those years. Let's stop Ignoring the Bull in Society's China Shop, shall we? Enough for now. I'm on to page 3 of the book.